A new report, “2018 Edelman Trust Barometer”, has said that with an aggregate 13-point decline India has found itself among the six top countries that have experienced one of the highest trust losses among the 28 countries it has analyzed. The calculation is based on India’s trust-level slipping in three of the four categories analyzed – government institutions, media and NGOs. While the trust in in the fourth category, business, remains “unchanged”, the report says, the biggest comfort for India is, the country’s loss “is considerably less than the 37-point decline recorded in the United States.” The other five countries which experienced losses are – Colombia (13 points), South Africa (17 points), Brazil (17 points) and Italy (21 points). “With the government in the fourth of its five-year term, expectations remain high, and the trust trends may point to people’s attitudes in the run-up to the coming general elections”, says Rakesh Thukral, managing director, Edelman India, in a commentary attached with the report. 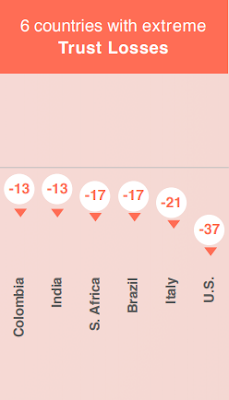 The report shows that, as against India, China experienced the highest 27 point gain in the world trust level, followed by UAE 24 points, South Korea 23 points, Sweden 20 points, Malaysia 23 points, and Poland 17 points. The report says, “China’s trust is soaring; it is now the No 1 market on the Trust Index among both the informed public and the general population. The government and media have always been highly trusted, but there is an inexorable rise in business and NGOs.” A year earlier, India was No 1 market, but the report finds the country slipping to the third position. “The middle class is growing quickly, and Chinese brands such as Tencent and Alibaba are moving aggressively into global markets. China’s trust scores are nearly matched by India, the UAE, Indonesia and Singapore”, the report states. 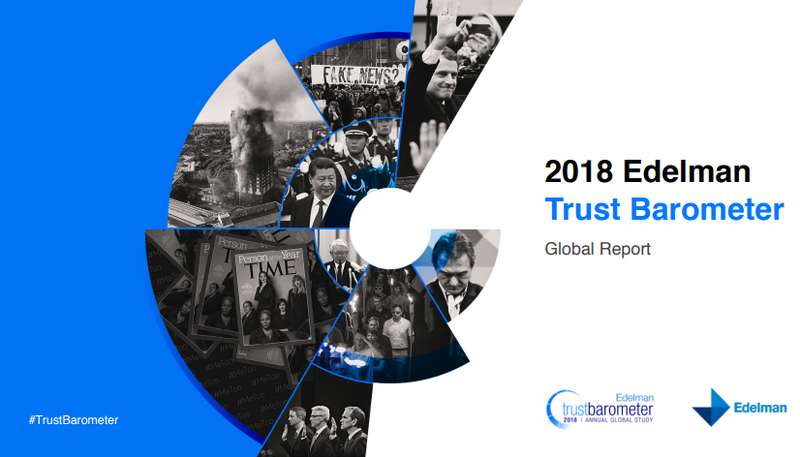 “From the perspective of communications, CEOs (75 percent) and journalists (59 percent) saw the greatest boosts in credibility this year, while technical experts remain the most credible spokespeople with trust credibility levels at 77 percent”, he adds.